SHOW DAY!! There’s always an air of excitement among everyone on a show day. Even breakfast was exciting (but hey….When is a beautiful buffet in a foreign country not super exciting?). Rehearsal at the track was a little different today since we had a dress rehearsal. We basically just went over timing logistics and did a full run in uniform. Which I think we were all pretty thankful for. It was really windy this morning but still hot, even in the morning. The stands created a decent block of most of the wind, which I know was a huge worry for a lot of us (mainly the guard, who have to throw things in the air and try to catch them, and myself standing up on a very shaky ladder). But so far so good! 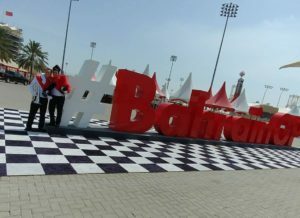 We got to do some section and group photos at the #BahrainGP sign which was fun, and a challenge to fit us all in there without covering up the sign. 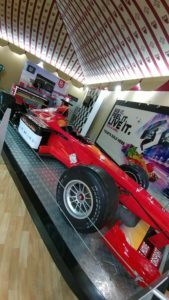 Today we stopped by the souvenir shop, saw some dinosaurs, raced some Formula 1 cars (only in a game simulation, unfortunately…but even just that was way more challenging than you would think!) and checked out the haunted house. A GREAT way to kill some time. We had a nice little relaxing block in our green room which was quite necessary to gear up for the performance, then got ready for the show! We had a very nice warm up and then played the “hurry up and wait” game to get everything set up for the performance. It seemed like things on the track were very stressful for all involved so we tried to help make things as smooth as possible. The performance was spectacular! There was a great energy in the truck along with some really dialed in performers….basically, all you could ask for. And……the wind even died down! The crowd also seemed to enjoy it. I feel like they were so intrigued by the whole thing that they weren’t quite sure how to respond. But excited nonetheless. We had multiple cameras shooting our show, and from the glimpses I got, it looked incredible! I hope that we will eventually be able to see that and share that with all of you! I feel like everyone felt really good about the performance, and as fast as it all happened, it was done. We got to stay and eat, chill and watch some of the race. The cars go REAL fast! So it definitely makes for a lot of excitement. 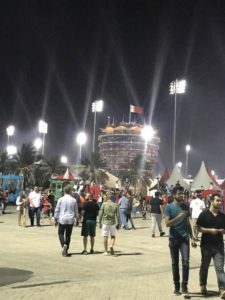 The BIC did a great job of the festivities at the track after the Ferrari team won. There were full out firework displays all over the track in several different locations. It was pretty magical. It’s crazy to think that’s what we came here to do. Mission accomplished! As for tomorrow, we get to enjoy the city a bit, and check out a lot of the local options, which I’m super excited about. I feel like with everything I observe and learn, it only makes me want to learn more. This has been an incredible opportunity for everyone involved and I can only hope that it helps open the doors for more opportunities exactly like it. What a great experience so far! 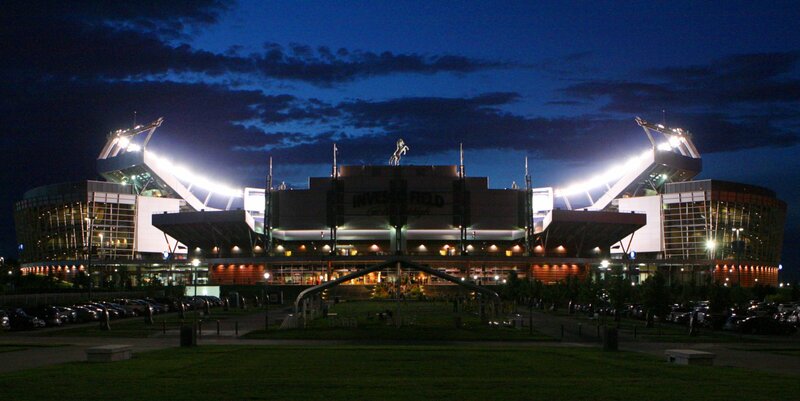 Can’t wait to share with you all some closing thoughts and wonderful stories throughout our journey tomorrow! 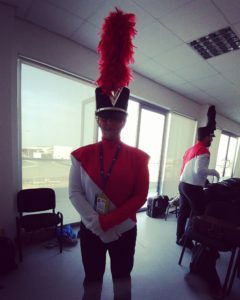 Be sure to check in each day of our Bahrain trip for Ashley’s insights as she leads this group of passionate performers to a place where no drum corps has gone before!! ∴ Read all blog updates here!